If you're looking for a healthy and DELICIOUS summer salad recipe, this Grilled Smashed Potato Salad is it. The potatoes are boiled, gently smashed, then grilled for tons of extra flavor. They're tossed with some greens and an easy to make lemony yogurt and chive dressing. 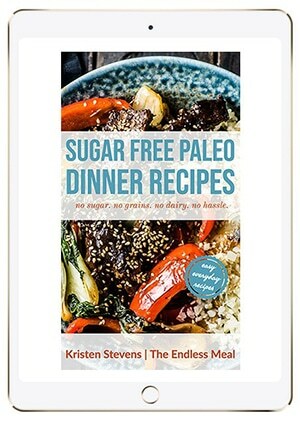 It's delish vegetarian + gluten-free side dish everyone will love! Pull out your sundresses, take off your shoes, and fire up that grill. Summer has arrived! Or close enough that I'm callin' it. You with me? To celebrate, I've turned my fav winter potato recipe into something certifiably summer-approved. Crispy/ creamy smashed potatoes have now become a Grilled Smashed Potato Salad. I'm talking about summertime MAGIC. You guys, I've got to admit that this recipe really surprised me. It started out as an “I don't want to turn my oven on” recipe but turned into a recipe that can really hold its own. 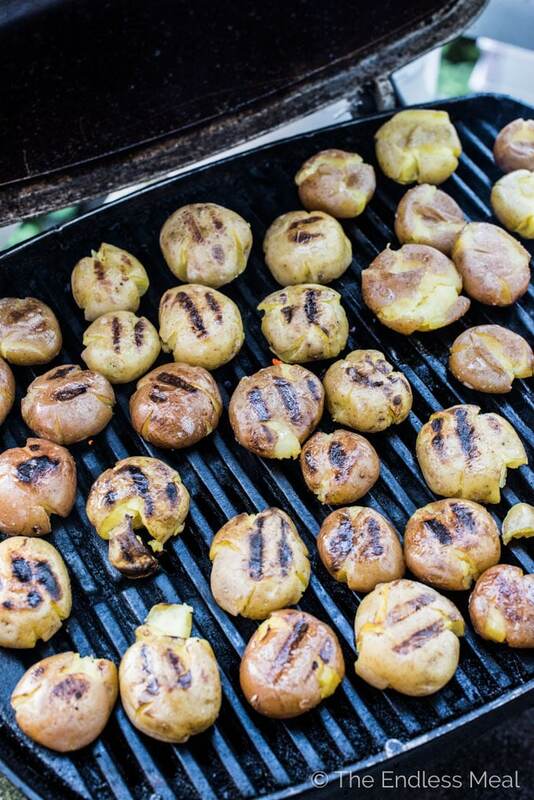 Grilling the smashed potatoes adds a TON of flavor. I was expecting the crispy edges and creamy insides, just like regular smashed potatoes. The smoky, grilled goodness as a bit of a surprise. Don't worry, it's not overwhelming. It simply adds an extra layer of deliciousness. So not going back! What I should be sharing (so you could have a good laugh) is a video of me trying to BBQ on that thing. We have it wedged into the corner on an angle since our balcony is so small we can't set it down straight. It's also on the ground so I have to kneel down beside it each and every time I put food on, flip it over, flip it over again, and take it off. It's awesome. ← Insert eye roll. 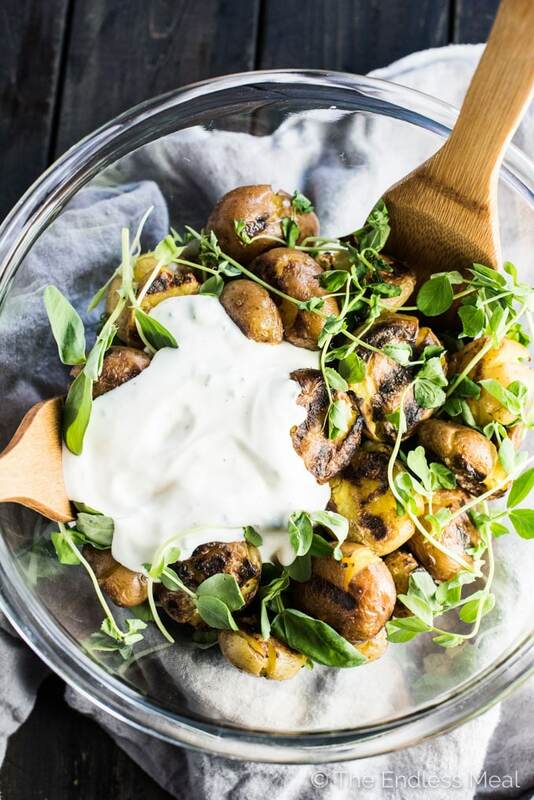 What is awesome is this Grilled Smashed Potato Salad. I mean, just look at those beautiful grill marks. ? Those babies are every bit as crispy on the outside and creamy inside as their oven-baked cousins. But these guys win (hands down) in the flavor department. The BBQ adds a smoky grilled flavor that no oven can match. I have a feeling I'll be braving the cold this winter just to fire up the grill for Smashed Potato Salad. Then there's the lemon yogurt dressing that I want to eat on everything, including by the spoonful. It's as simple as it gets, but the flavors are perfect together. I use high-fat yogurt because that's the way I roll. The brand I normally buy (Olympic) has a Balkan-style, 11% milk fat yogurt that is beautiful. It's the highest fat yogurt that's available in the stores I shop in so it's always the one I reach for. If you're trying to save a few calories, you can opt for a lower fat option. Just make sure that it is thick and doesn't have any sugar or flavorings in it. You're going to take that yogurt, squeeze in some lemon juice, stir in some chives, and give it a pinch of salt and pepper. That's it! It's simple and the perfect dressing for the smashed potatoes. ♡ Grab a pot, fill it with water, add the potatoes, and bring it to a boil. So far, ridic easy, right? ♡ Drain those just-soft-enough potatoes and let them cool a little. Hot potato! Hot potato! ♡ Squash (or smash) them between your palms. If you're going for a smash, make it a gentle smash. You don't want to obliterate them. 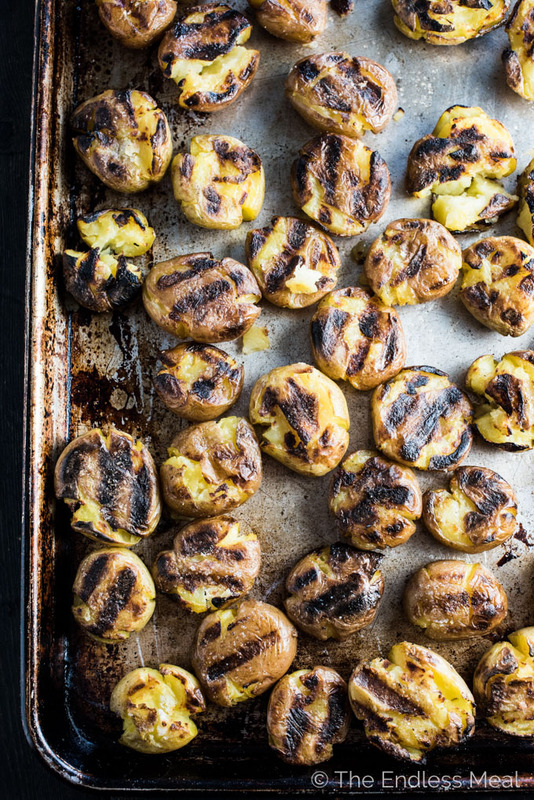 ♡ Butter up those salted potatoes and throw (or maybe just place) them on the grill. 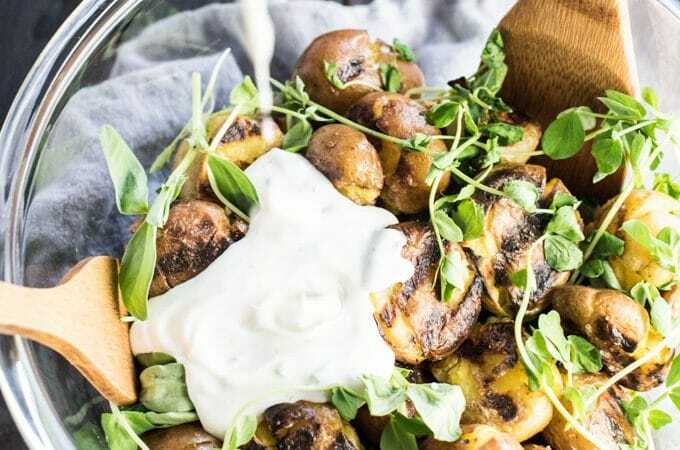 ♡ Use the grilling time to whip up the yogurt dressing and then pour it over the potatoes when they come off the grill. After you whip up your Smashed Potato Salad, serve it with this Lemongrass Grilled Chicken, some Grilled Mustard Chicken with Walnut Sauce, or this easy to make Honey Teriyaki Salmon recipe. If you're looking for a healthy and DELICIOUS summer salad, this Grilled Smashed Potato Salad is it. The potatoes are boiled, gently smashed, then grilled for tons of extra flavor. They're tossed with some greens and an easy to make lemony yogurt and chive dressing. 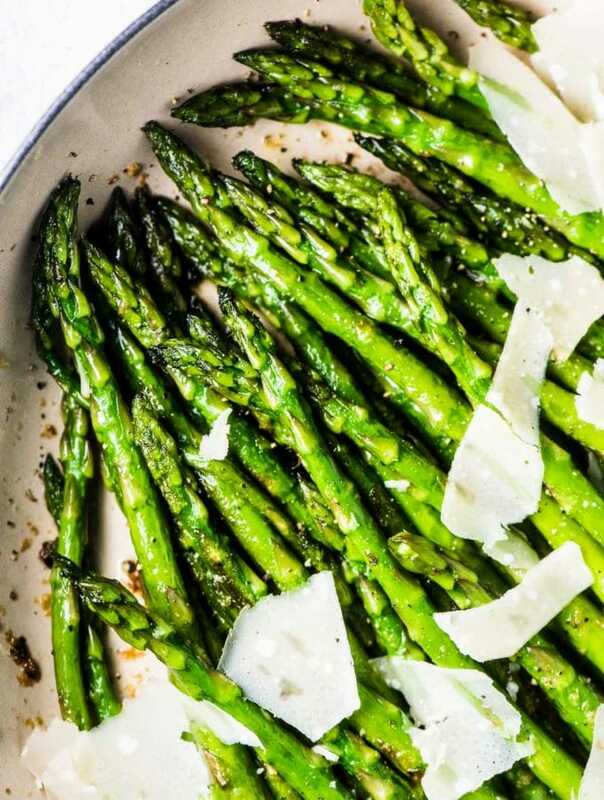 It's delish vegetarian + gluten-free side dish everyone will love! Bring a large pot of water to a boil. Add the potatoes and simmer for 8-10 minutes, or until they are soft but not falling apart. Drain and set aside to cool. Oil your grill and preheat it to high. 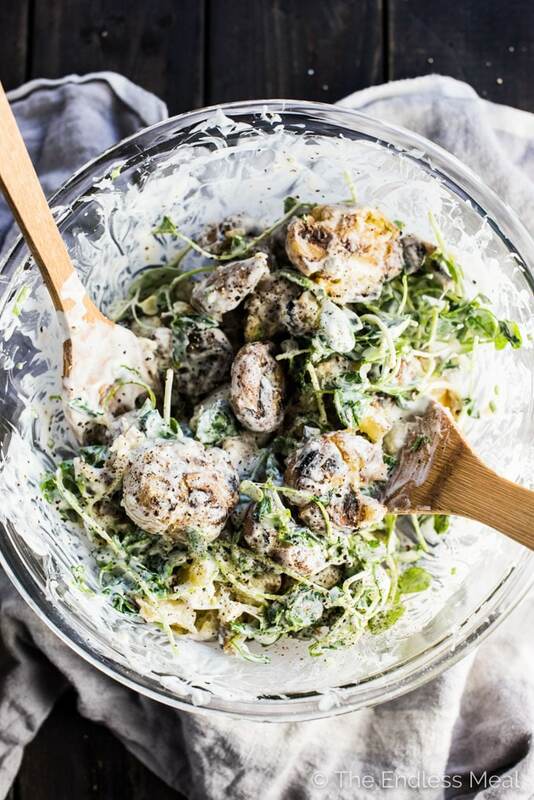 Whisk the lemon yogurt dressing ingredients together in a medium-sized bowl. Squish each potato between your palms to flatten them a little. You don't want them to fall apart, so make sure to be gentle. 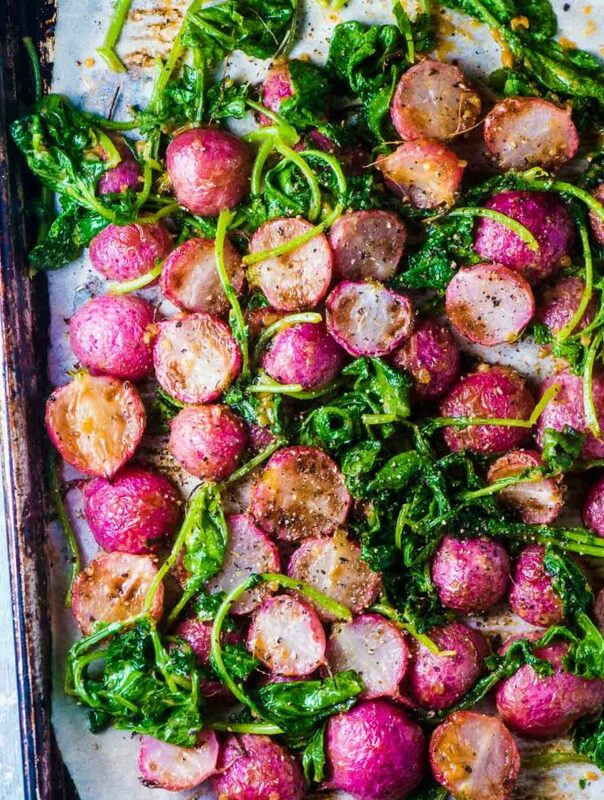 Place the smashed potatoes on a baking sheet and drizzle with half of the butter and sprinkle with the sea salt. Grill for 10 mins, flipping and basting with the remaining butter halfway through. Place them in a bowl and let them cool slightly. Add the greens to the bowl then pour the dressing over the top and gently toss. Either serve right away or let it come to room temperature. I use a high-fat yogurt as that is what I always have on hand. I've calculated the calories using a low-fat yogurt because if I was counting calories that's what I would use! Choose whichever suits your diet the best. I love potatoes, and I’m always looking for something different to do with them. This is definitely different. I can’t wait to try it.